YWCA is on a mission to eliminate racism, empower women, stand up for social justice, help families, and strengthen communities. That’s why for more than 20 years, we have set aside one week in October as a Week Without Violence (WWV). WWV is part of a global movement to end violence against women and girls. Follow the link to watch your video invitation! I recently participated in the Zonta Club of Malden and the Malden Teen Enrichment Center’s (MTEC) second annual STEPS Walk (Steps Toward Empowering Personal Safety). The walk was a collaboration of community groups that brought the issue of domestic violence to the forefront. I think the event serves as an example of working together to not only raise awareness, but to also provide information about the services and resources available to assist victims. Assisted with the filing of over 195 Restraining Orders and 30 Harassment Prevention orders in the Malden District. As a City, we are working hard to improve our prevention measures and response efforts. With the assistance of Police Chief Kevin Molis and the support of the City Council we now have a detective dedicated specifically to the Domestic Violence Unit. Officer Elijah McNeal works hand-in-hand with the courts and support agencies to assist victims. Additionally, through grant funding from the Junior Aid Association and Malden Industrial Aid Society, the Malden PD now has an on-site Domestic Violence Liaison from the agency RESPOND, Inc. Victim advocate, Samantha Nunes, divides her time between the Malden Court and the Police Station, and works closely with Detective McNeal as a resource for victims needing support, shelter, counseling and legal services. There is no doubt that we have to remain pro-active and take responsibility for raising public awareness and for providing better support services. I believe that by working together and collaborating with advocates, victim service providers and organizations like the YWCA , we will make a difference in the effort to end the violence. We have come a long way in addressing the epidemic of domestic violence, but we still have work to do. Some statistics cite that one in three women or girls will experience domestic violence in their lifetime. I am grateful that I have not personally experienced violence in my life. However, I have a dear friend, as well as a family member who have suffered verbal and vicious physical abuse by the very person whom they loved. By raising awareness and publicly advocating for victims we have made progress. Vigils, education forums, and walks are held in the month of October to shine a bright light on domestic violence. The Zonta Club of Malden and Zonta International, through their Zonta Says No to Violence Against Women campaign, have just completed their second annual STEPS walk (Steps Toward Empowering Personal Safety). This walk, founded by the late Joanne Lambert, is in collaboration with the Malden Teen Enrichment Center, the youth of the YMCA, the YWCA and the Z Club. The Step-off ceremony that preceded the walk this year included remarks by Mayor Gary Christensen, Middlesex District Attorney Marian Ryan and a presentation of the Silent Witnesses. The exhibit at the STEPS walk in 2015, provided by REACH Beyond Domestic Violence, included 14 silent witnesses, one for each of the 13 people that had been murdered by domestic violence thus far in 2015, plus the additional figure representing the unknown victims. Sadly, the 13 victims this year were 11 women, ranging in ages from 17 to 55 years old, and 2 men, both in their 30’s. The walkers departed from the Salemwood School, led by Mayor Christensen, marched along Salem Street, down Holden Street, and returned to the Salemwood School along the bike path. Banners and signs proclaiming messages against domestic violence were held. DA Ryan remarked that the issue of domestic violence is a hidden one, one that is kept private and behind closed doors. By walking past houses and businesses, the walkers demonstrated to victims and perpetrators that violence in all its forms is not tolerable. So, back to the question: How can we work together to end domestic violence. I don’t have the answer, I only know we need to continue the conversation about it; remain aware of it, and equip ourselves with information about where victims can get help. We are fortunate to have many local agencies, such as Portal to Hope, the Intimate Partner Violence Project, the Melrose Alliance Against Violence, Respond, and REACH Beyond Domestic Violence. As the current President of the Zonta Club of Malden, I am proud of the work of Zonta International. Locally, in addition to the STEPS walk, the Zonta Club of Malden produced a Public Service Announcement in 2013 that aired on MATV, as well as produced posters that hang in local ladies rooms with information on where victims can seek help. Internationally, Zonta is funding projects, including delaying early marriage in Niger, piloting a Gender Responsive Schools Model in Vietnam, and contributing nearly $1,000,000 toward the Voices Against Violence, a non-formal education curriculum for the World Association of Girl Guides and Girl Scouts on ending violence against women and girls, among others. This month marks the 20th Anniversary of YWCA Week Without Violence. Has there been any progress in the last two decades? Absolutely. The most pivotal part of the story is linked to the passage of the Violence Against Women Act in 1994, signed into law by President Clinton. According to the data from the US Department of Justice there has been a 64% decrease in domestic violence from 2003-2010! Is there more to be done? You know there is. 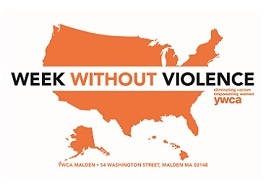 Join YWCA Malden and YWCA’s across the USA as we mobilize people in our communities to take action against all forms of violence wherever it occurs. Our approach at the local level: awareness campaigns, political advocacy, and an exciting new youth violence prevention initiative. Join us on October 21st for our local Week Without Violence event.